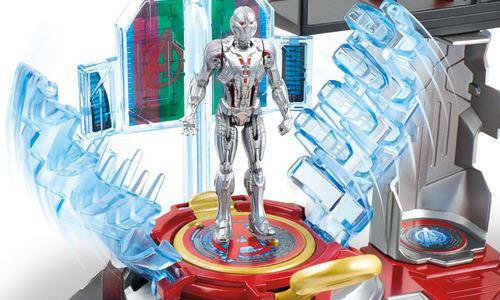 NYCC: Hasbro Reveals First Avengers: Age of Ultron Toys! To mark the occasion of New York Comic Con starting, Hasbro has officially released images and descriptions for the first toys and action figures for the upcoming Avengers: Age of Ultron! 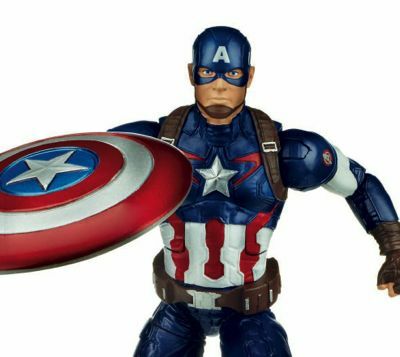 Included in the line up are the Iron Man Arc FX Armor, Hulk Gamma Grip Fists, Captain America Star Launch Shield, and Cycle Blast Quinjet all set for release in February 2015; and the Marvel Legends Infinite figures for both Captain America and the Hulk, which are being targeted for a spring 2015 release. In addition, Hasbro has confirmed that the “Age of Ultron” line for Legends will also include Iron Man’s brand new Mark 43 armor as well as a Thanos build-a-figure! Check out the images in the gallery viewer below. Opening in theaters on May 1, 2015, the highly-anticipated sequel also stars Robert Downey Jr., Chris Hemsworth, Mark Ruffalo, Chris Evans, Scarlett Johansson, Jeremy Renner, Samuel L. Jackson, Aaron Taylor-Johnson, Elizabeth Olsen, James Spader, Cobie Smulders, and Thomas Kretschmann.